COCONUT CREEK — No experience. No problem. 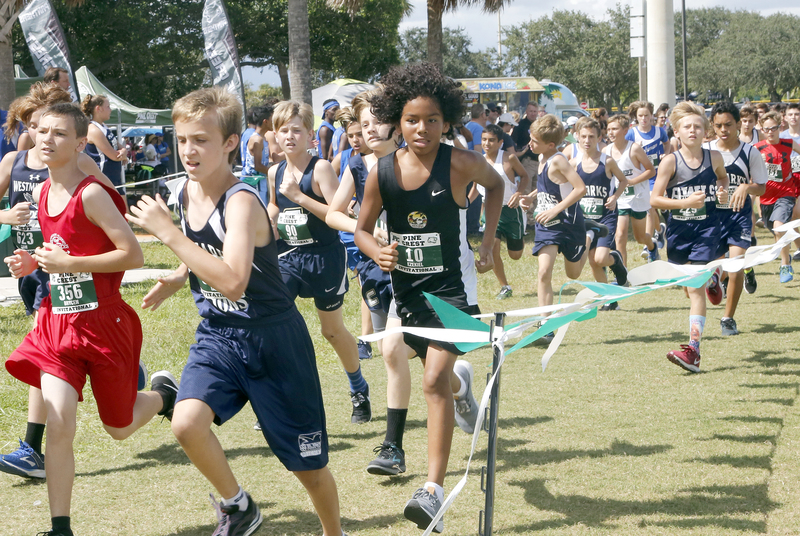 For the only three runners on this year’s Ahfachkee School cross country team, the Pine Crest Invitational on Sept. 21 marked their first-ever cross country race. 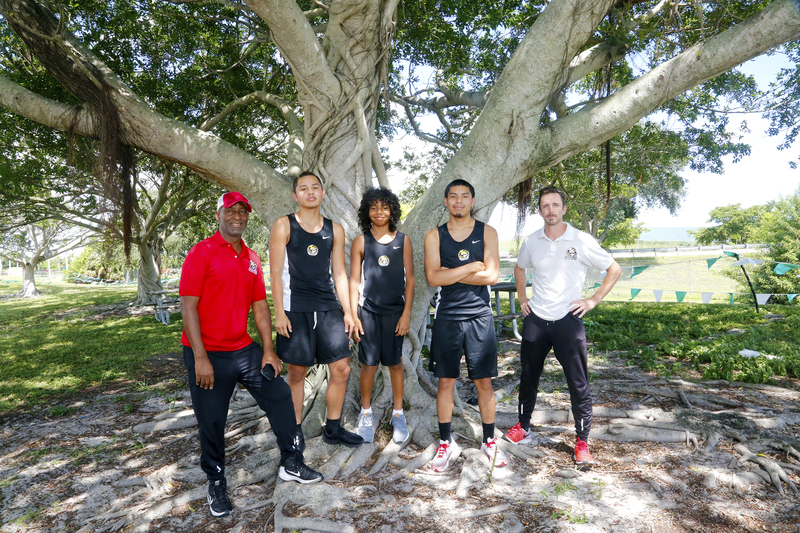 All three – Leslie Gopher Jr., Jeremiah Pickup and Ezekiel Billie – accomplished the goal of just about any competitive runner: cross the finish line. 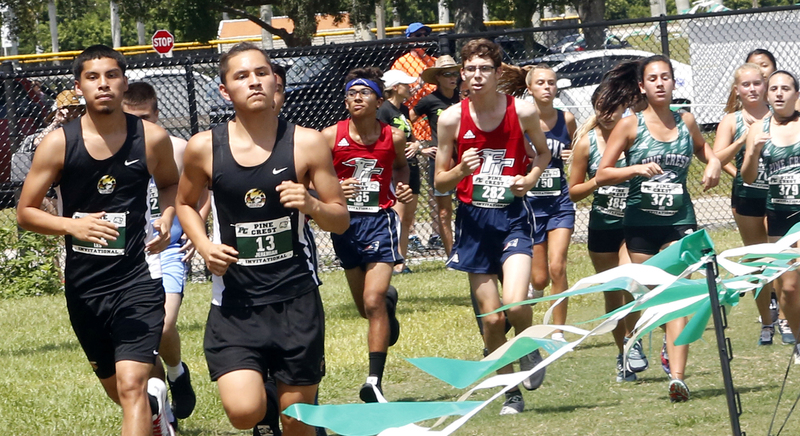 The meet featured hundreds of runners and about two dozen schools, mostly from Broward, Dade and Palm Beach counties, on a sweltering, sun-splashed afternoon at Tradewinds Park. Gopher and Pickup competed in the combined boys and girls junior varsity 5K (3.1 miles). Gopher, a senior, finished in exactly 28 minutes while Pickup, a freshman, crossed the line in 31:25. Billie, a sixth-grader, finished the boys middle school 3K (about 2 miles) in 18:26. “It was all right. It was tough at the end. I was happy to finish. I just wanted to get it done,” Gopher said moments after he finished in 22nd place out of 49 boys in the race. Despite running in his first race, Gopher said he wasn’t nervous. He said he wished he had started running cross country earlier in high school. “This is my last year, so I wanted to do it. I wanted to try it. I liked it,” he said. Ahfachkee coach Matthew Beckham liked what he saw, too. It was only a couple days before the race that Gopher ran the 5K distance for the first time in practice. 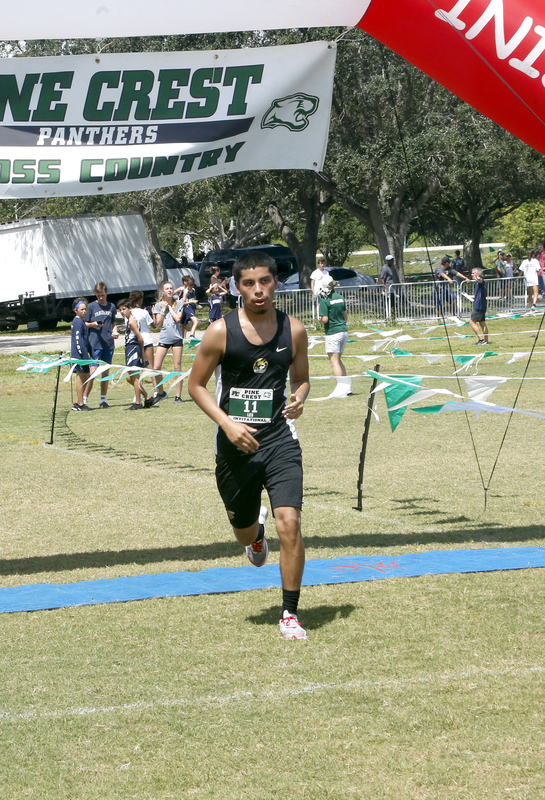 In the Pine Crest race, he ran a smooth, solid pace and never struggled. Gopher and Pickup ran about one-third of the race side-by-side before Gopher started to pull further ahead. He didn’t remember separating from his teammate. “I was so focused,” said Gopher, sounding like a veteran runner. Pickup, who finished 29th, said the first two laps around the course were easy, but the final lap was tough. That’s when he began to feel the draining effects from his first race. “I was tired,” said Pickup, who had missed some practice time due to an injury. Knowing that basketball is Pickup’s primary sport – he had an outstanding season for Ahfachkee last winter – Beckham pulled out his phone and asked into it how many miles does a basketball player run in a game. The response was 2.72 miles. Beckham immediately relayed that tidbit to Pickup and explained how cross country will help prep him for the basketball season. “Jeremiah did fantastic for his first time. He has a promising future. The sky is the limit for him as long as he shows up and puts in the work,” Beckham said. After the JV race, the middle schoolers took center stage. Billie looked right at home in his first race, running in the middle of the pack for most of the race in a huge field of 149 boys. He ended up finishing 125th. Afterward, Billie said it was tougher than he expected. Ahfachkee has five meets on its schedule, including the Class 1A-District 14 meet Oct. 16 at Quiet Water Park in Deerfield Beach.